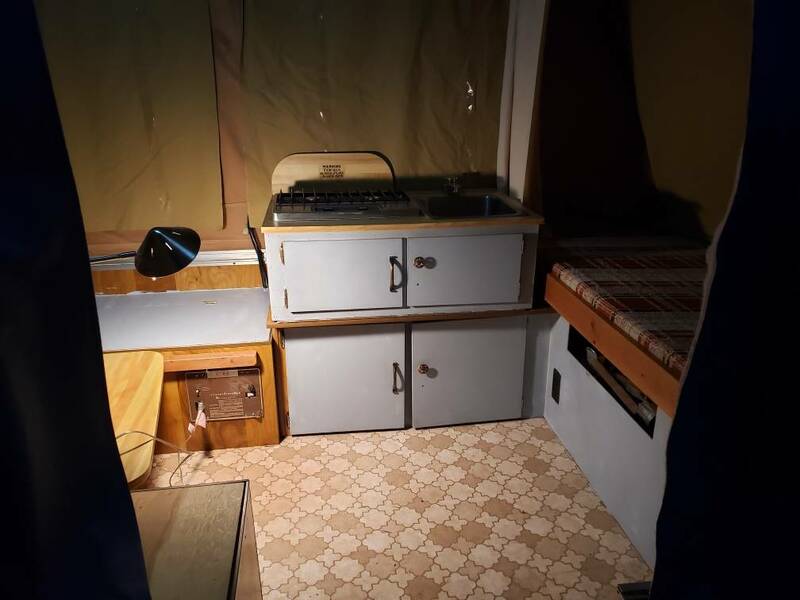 Discussion in 'Camper Restoration Projects' started by Mtn_man, Feb 13, 2019. Starting a new... 1980 Coachmen Sunlite c-160 project. my first popper, Free-99 for the camper, and it has essentially permanent registration which is awesome. It came from the original owner with all the original documentation / manuals (hilarious to look through). all of the exterior handles to lift it open are broken. The roof vent was left open and leaked some in the interior but not too bad - there was no serious soaking and all the wood is in good shape still. There are some dents. Some surface rusting. One broken zipper on the tent. A tail-light that's out. Tires are... old. There is no wheel on the front to jack it up with... But everything seemingly works. New wheels / tires + spare + cover. New exterior grab / lift handles. Roof rack for my bike / Sup boards. Add insulation / paint recover interior roof. In your shoes, I'd worry about the tires first, and everything else after that. My weekend in the Starflyer told me I might need to put memory foam on the "adult-side" bed. I slept better the second night than the first, but it might have been that I figured out what I needed to do to stay warm and comfortable. Still, I think the wife might need a little extra "cush." Mason was fine, but 9 year old kids usually are. He also had my down mummy bag, an Army surplus find that was good to -40 in its prime and can still handle anything Planet Georgia can dish out. Like you, I'm also debating on whether to replace the fridge. I was thinking about putting in a slide-out, so I could swap in a cooler. I can see configuring it one way or the other, depending on the situation. I also have to flush the water system, but that can wait for a month. Once the hard freezes are over with, I'll get jiggy with the bleach. I have RV antifreeze in there for now. Oh, and I don't have a wheel on the tongue jack, either. Long-term, I have a list. But I think we can get through this year without major upgrades. Once we're familiar with the camper, we'll know what we need to deal with first. I was able to complete the painting of the frame. It looks great! Pictures are too large to upload so I will resize them later.. Led lighting (int/ext) is all done with new marker light covers throughout. 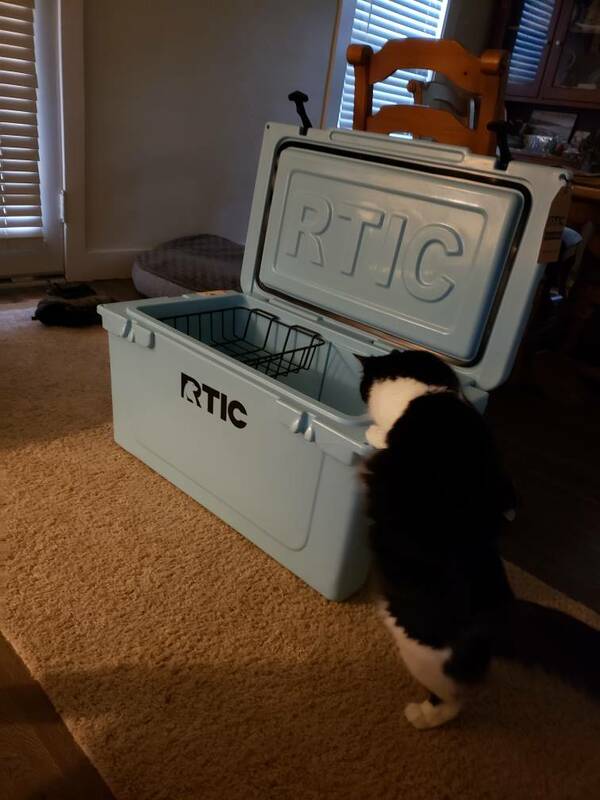 I removed the ice box from the trailer and will need to plug the drainnhole... I was happy to see the floor pattern continued past the face of the 'fridge'. I did a bolt check and tightened some various loose bits I found. All of the handles used for lifting the roof were broken and the bolts seized but I was to cut them all off and get the hardware out. New handles coming up. New spare and cover have been installed with a lock. I will be replacing the handles, the rear clasps/clamps as I broke the oxidized originals this weekend, and i have new alloy wheels / new tires to do next. I need to check the wheel bearings and still have the roof rack to install as well but that should conclude the exterior work. Water system flush and interior paint coming up soon as well. Can't wait for the first trip, 395 hot springs hopefully. Also I realize after moving the table around a few times now how freaking heavy it is. I may ditch it. Or remake it with something lighter. We won't have anyone using the table-bed. Any weight savings is good for my 4 cylinder. Finally some pictures of the progress. Primer is underway on the inside. I could only get away with a little at a time due to temperature but its just about all primed now except the ceiling and end-bunks. The finish color is going to be a little darker - but should blend well with my new Rtic cooler colorway.